Last Sunday afternoon was quiet in the garden; too cool for the loud whining of cicadas, and no wind to swish and rattle the leaves. However, a persistent high-pitched buzzing in the anemones was driving my husband nuts. Turns out it was the sound of several bumblebees releasing pollen through sonication or “buzz pollination“. In sonication, bumblebees, and other native bees, hold onto a flower with their jaws or legs, press the upper portion of their body into the flower and rapidly vibrate their flight muscles to jar loose pollen. The freed pollen clings to the bee’s furry body. Some of it is collected in the bee’s pollen baskets to be brought back to the colony, and some fertilizes the next flower that the bee visits. (The pollen basket is located on the outside of the bee’s back leg. It’s easy to see when it contains pollen because it will be yellow, orange or red, depending on the type of pollen it contains.) Buzz pollination is essential to plants such as blueberries, cranberries and tomatoes, in which the pollen is firmly attached deep inside a tubular anther. However, bumblebees also use it to release pollen in other flowers, such as the Japanese anemones in our garden. 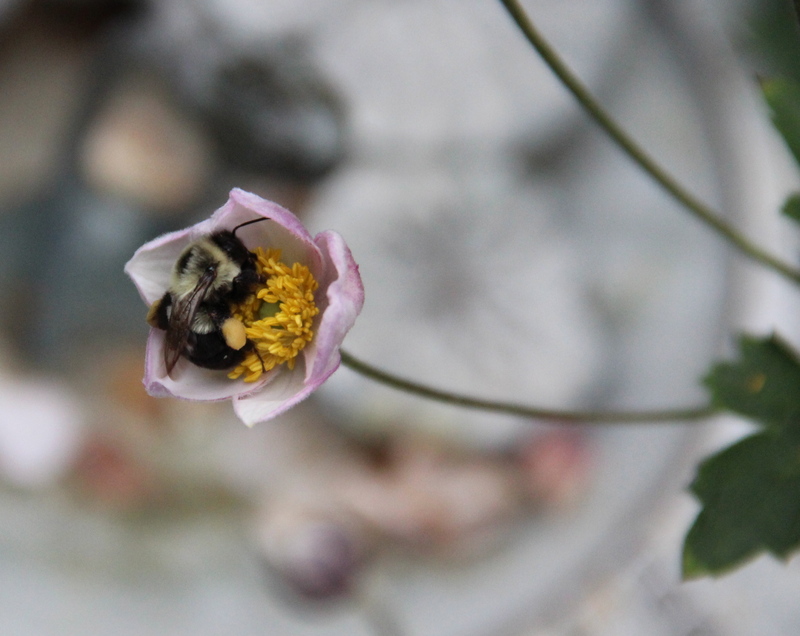 A bumblebee buzz pollinates a Japanese anemone in our garden. In addition to the buzz pollination video link in the text above, find out more about pollination and bumblebees from master naturalists Paul and Mary Meredith at VictoriaAdvocate.com. This entry was posted in Bumblebees, Garden, Insects, Saint Paul, MN and tagged bumblebees, buzz pollination, sonication. Bookmark the permalink.